I often times speak of “carrier oils” when I am discussing recipes that you can make using essential oils or when applying an essential oil topically. Because the world of essential oils can be somewhat overwhelming, I wanted to try to simplify some of the carrier oils for you. 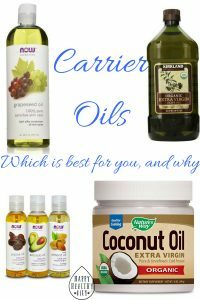 Some people have a personal preference to use for everything when it comes to carrier oils, and others, like me like to use a different carrier oil for a different task at hand. Carrier oils can be used to help spread the essential oil around on the skin to cover more surface area, or they can simply be used to dilute a “hot” (spicy, may irritate skin) oil so that it isn’t so concentrated in one spot. Coconut oil is super moisturizing so if you have dry areas (elbows, feet, etc) this would be a great oil for those places. But use with caution on your face because of the rating. I do know a lot of people who use coconut oil in their face wash without problems, but I’m not going to risk it with D3 and have a teenager meltdown if it does clog her pores. You can purchase coconut oil here or here(prime pantry Natures Way brand). Helps reduce the size of pores and helps to reduce skin imperfections when used over time. It also may protect against free radicals. High in antioxidants and Vitamin E that can help improve the appearance of skin. Highly moisturizing as well. (4) You can purchase avocado oil here. This oil has antioxidant properties and can help keep your skin soft and clean out pores. It can slow the signs of aging on your skin and help reduce the appearance of dark circles. Sounds like this is one I will personally be using for my face wash. (2) You can purchase sweet almond oil here. This oil also has antioxidant properties and can reduce the signs of aging. It is moisturizing and can reduce inflammation. (1) You probably already have this in your kitchen, but if not, you can purchase olive oil here. Said to be a similar oil to what your skin naturally produces so it may make the skin think it is producing enough natural oil, when using this, so it can potentially balance natural oil production. It absorbs well into the skin. (3) You can purchase jojoba oil here. Contains vitamins C, D, E and beta-carotene. Helps reduce the appearance of wrinkles, with acne, and younger looking skin. (5) You can purchase grape seed oil here. As I mentioned above, there is a long list of potential carrier oils. Some are more expensive than others, and some harder to come by. If you are interested in trying out several of these, you can get this three pack, which includes jojoba, avocado, and sweet almond oil (these are each 4oz bottles). These are some of the most popular and ones that I have in my personal carrier oil collection. They are all great in the recipes I have posted on my blog in the past. Be on the look out for my next blog post, in which I will be posting recipes for face wash using these and essential oils. You’re welcome Alethea! SO glad you enjoyed it!